Can it really have been ten years? I count the steps. I am climbing Loughrigg, near Grasmere, an easy enough task – I think – to check out my muscles and lungs, to get back onto the hill, to re-ignite the flame of a lost love. I can’t remember the last time I walked up a mountain; definitely more than ten years ago. My memories of the last hill are lost in the swirling mist of my mind. Hidden by all the other things that have demanded my attention over the past few years. Lethargy had crept in; like the cloud that is now beginning to obscure the hills. I stop, recover my breath and admire the view. Stepping on again, I discover that I have lost count. I think it was about 300, or was it 200? Never mind, it doesn’t matter. It was just something to do. I carry on. Whilst talking to someone last week, I mentioned that I don’t get out much these days. He laughed. I could see the humour in my comment, especially as I was in a climbing shop buying ’TechWash’ for my outdoor gear. Familiarity can be so true for many of us, especially when we live so close to the hills. Days pass into months, into years. I had lost the joy of walking in the fells. My comments and his reaction, were the catalyst that spurred me into action that day. I still have my gear, so why don’t I get out on the hill again? That was it; I made a decision that whatever the weather I would get out on Monday. So here I am, Monday morning, climbing up Loughrigg: an easy enough hill to test my latent stamina. I seek to reclaim what is lost: the joy of walking on the hills. 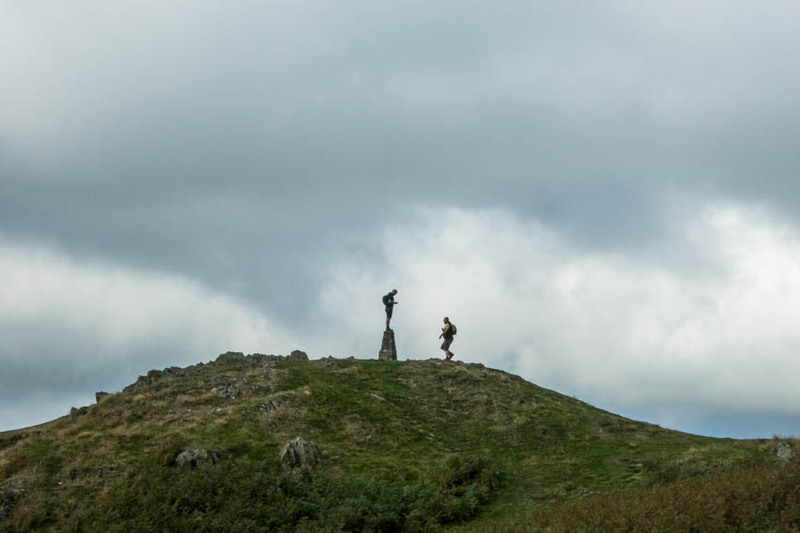 Except for the initial steep ascent, Loughrigg is an easy enough mountain, and the route to the summit is not strenuous, bringing rewards of tremendous views into Langdale. Rhythmic, crunching, rock scraping over rock, stones grinding and crumbling into dust; all this is just sweet music to my ears. My boots squeak and bend, twist and turn on rocks. They are singing, glad to be alive again. I have missed all this. I savour each step, scramble over rocks, slip, as shrapnel scrapes on sloping slabs. It takes me a while to rediscover my balance. In my mind, I could be anywhere. I travel back into the high Munros of Scotland. Recall memories of long slogs into the Cairngorms. Climb along the rocky trails of the Alps and crunch through frozen snow in the dawning light of new days. Fight up endless scree on the Cuillens, and weave upwards across Brown Tongue onto the heights of Scafell. I daydream; lost in the past; wander through years and years of climbing, of epic ascents in the days of my youth, of warm sunny days basking by lochs. Of rapid, airy, abseils down rock faces that had turned into waterfalls, where just a few hours before they had been cracking in the heat. The bite of the wind shook me out of my reverie – colder at this height. I chilled as I turned a corner – smacked in the face by the wind howling over the ridge. I put on my jacket. I was alone on the hill, for the moment. Most people were at work, children at school – the weekend finished. A man I met at Rydal Cave had come from Rugby for a week’s holiday, and later I passed by a group of six on a school trip. Stickle. In the opposite direction, Windermere glittered like a ribbon of silver. I sat down in the lee of a hill, sheltered from the wind. On the summit, a couple posed for pictures. A walker stood on the cairn, turning a complete circle – like a dancer on a musical chime – taking a panoramic picture. Their voices drifted away, born on the wind, becoming little echoes among the fells. Then they were gone. I was alone. Silence blanketed me. I basked in it; it was golden, in fact, it was diamond. The wind whispered through the grass, swooshing, moving like a carpet. Skylarks chirped, rising high on thermals. A fly buzzed past my ear and flew over the hill. I had forgotten how quiet, how relaxing the fells can be. The sun, like a spotlight, swept over me, highlighting me on nature’s stage. The wind stopped as I always remembered it doing. The stage set. Silence; the audience awaits. My part in the scene was to return to the stage. Applause. The curtain fell; thick clouds race overhead, black and threatening, white and fluffy. Carried along on high jet streams, interspersed with others lukewarm and grey; much lower, much faster than the wind on the ground. End of scene one. Interval. In those minutes, a lifetime of walking had burst out of my subconscious. I don’t want to leave. I had forgotten this bliss, this beauty, this ethereal existence. Clothed in warm sunlight, I lie on the carpet of grass, looking at the sky, writing these words. 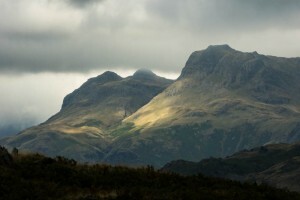 Sunlight races along rocky fells, down the valleys, bending over mountain summits with the ease of a deer. 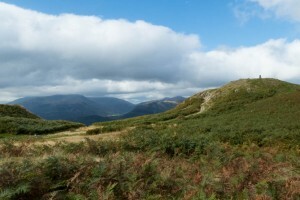 It runs its course along Elterwater, travels through the Langdale Valley, before gliding over Pavey Ark. The Pikes light up in a blaze of colour, then disappear into shadow. Clouds catch the escaping sun, tangle; then both disappear into Langthwaite. The landscape is the front window of my room, the real world. I watch; sat in nature’s armchair. More people appear on the summit; groups pose for a picture. Laughter and chatter carried along on the wind, passes over my head, then is gone, silence returns. It is now time to leave this sanctuary and begin my descent. It is lunchtime; the fells are filling up. A couple clatter up the path, tapping their poles. A group pauses while the leader points out various mountains. I pass by Tilley hats, bush hats, more poles, trainers, boots, dogs, children on extended holidays or trips. Two girls, laughing and joking, using smartphones, sit on what resembles a new bench straight out of B&Q, highly polished, it looks incongruous amongst the rocks and soil. The sun burns away the clouds, its warmth touches my neck. Courteously, a voice calls from behind me, “Excuse me, could we just get past?” I stop, move aside, just in time. Two mountain bikers bounce over the rocks and race past. I could never get into mountain biking; I tried it – it looks great – but I would rather walk, or cycle on the road. For a while I ran over the fells, which is as close as I got to mountain biking. There were over 1200, by the way: steps. Pitched by volunteers and rangers from Fix the Fells, who spend all year looking after the paths. There are well over 2,000 steps to the summit; I counted them on the descent, much easier that way, no need to draw breath and forget. There will be more, or less, depending how you walk, and which route you take. I had snatched a couple of hours after dropping my daughter off at school. Now it was time for lunch, then back to work. ‘I’ll be back.’ Now where have I heard that before? But I will. I will be back. I had broken out of the mould, taken back some of the years that the locusts had eaten. Rediscovered a passion that had hidden in the shadows. I have another window tomorrow. Today went well, better than I expected after ten years away. They say that the joy of walking never leaves you, it doesn’t, once bitten …! The text and images on this website are the copyright of ©Eric Whitehead, and are protected under international copyright laws. Please respect this and do not copy any text or download any images, please contact me first. Thank you.